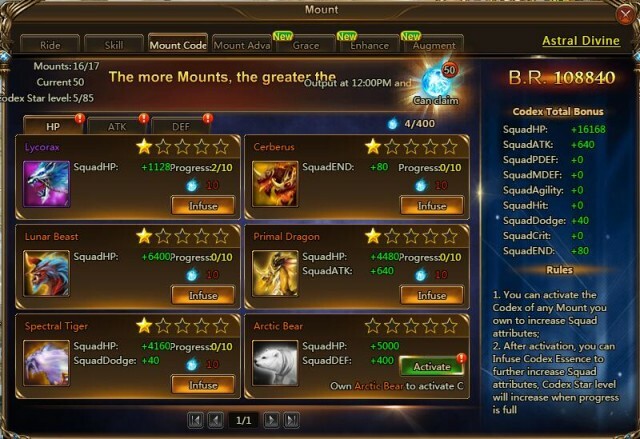 League of Angels II has just introduced a new feature called Mount Codex along with a new set of Mythic Armaments to Mount system! Players can now get additional rewards and bonuses for every mount they own. After activation, each Mount Codex will provide bonus attributes to the player’s entire squad. How can you make full use of Mount Codex and Mythic Armament to boost your BR? Check out the following guide! Activate Mount Codex and experience a great leap in Battle Rating! The Mount Codex can be found in the Mount system and is available to all players level 70 and above. Mount Codex offers three different stats, HP, ATK, and DEF. Once a codex is activated, it will immediately provide attributes for your squad. Mount Codex can also be upgraded with Codex Essence, which increases the attribute bonuses. The codex attributes stack with each other, which means the more mounts you own, the greater your attribute bonus will be! Codex Essences are generated automatically each day according to the amount of mounts you activated in Mount Codex. Along with the huge addition to the Mount system, a brand new Mythic Armament: Dragonfire has also just appeared. There are four pieces of this mythic armament, Dragonfire Orb, Dragonfire Helm, Dragonfire Armor, and Dragonfire Reins, which provide ATK, HP, PDEF, and MDEF respectively. Armaments can be made much more powerful through enhancing and augmenting. The higher the quality of the Armament is, the more attributes that can be upgraded. Dragonfire Armament will definitely be one of the most powerful armaments. Don’t miss your chance to equip your mounts in this hot new armament!